What makes Chinese culture so profound and extensive? There is no easy answer for this question. But you sure can find more reasons by knowing more about the ancient educational system of China. I myself am no expert of Chinese ancient culture. And even though I’ve heard Confucius like a thousand times and I’ve learned parts of The Analects of Confucius just like any other student in China, I am not really a fan of Confucian culture. Train tickets in China are always good on sale. Hence to ensure we can get on the earliest Inter-city train from Chengdu to Duajiangyan, we bought our tickets to and back from Dujiangyan one day ahead online. Our train departs Chengdu at 6:48am, so that I had to get up really early at 5:00am. Indeed an early-rising would make one feel sleepy, but half an hour’s nap on the train is just enough for charging myself. Get out of the Duajiangyan railway station, the taxies and public buses featuring panda patterns caught my eyes immediately. They are just so cute!! Not all taxies and public buses there have panda patterns, but that’s undoubtedly a plus point for Duajiangyan. 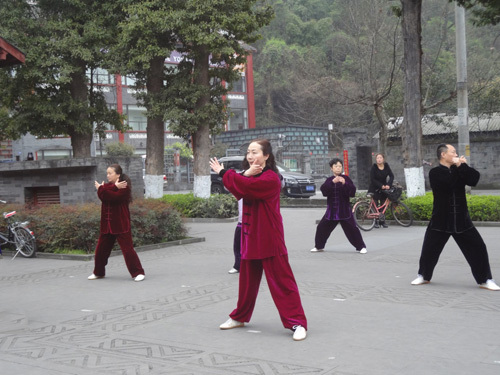 Right before the entrance of Dujaingyan Confucius Temple, a group of middle-aged people were practicing tai chi. And if you are lucky, you may encounter Mr. Cao teaching some basic moves there. That’s when I know that an early-rising is worthwhile! Nothing compares the joy of relaxing through doing such basic moves under the guidance of a professional coach of tai chi. After the “tai chi lesson”, the Confucius Memorial Ceremony began. 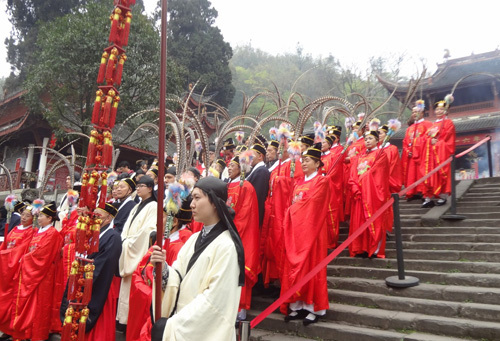 Such ceremonies are unusually held on the 2nd or the 8th month of Chinese lunar calendar in honor of Confucius. 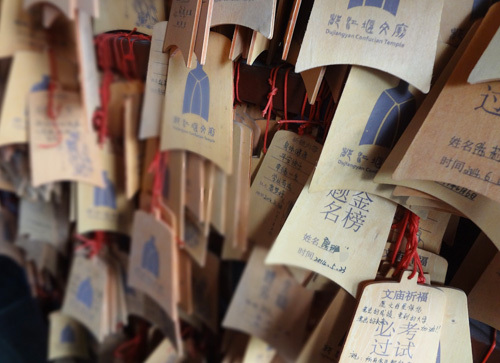 They are called “Worship ceremonies on Ding Days”, also called “祭丁” or “丁祭” in Chinese. The Six Yi Dances and classical court music were presented that day. And it’s really amazing to see how certain ordinary utensils could give out such beautiful and pleasing music!! Then we went back to the temple, and were just in time for the Six Arts Experience Activity. We were supposed to wear Han-style clothes during the activity, but as we were on a tight schedule that day. We skipped the procedure and watched the Archery Show presented by five archers. 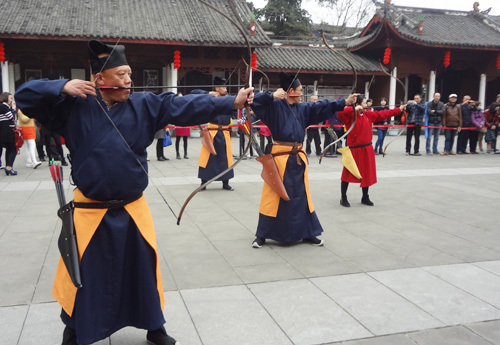 These kind archers told us a lot useful tips on how to hit the bull’s-eye. But of course, these tips alone couldn’t make a professional archer, practice is something cannot be told. After the archery show, our guide gave us a brief introduction of Six Arts. According to the Aristocrat Education in Zhou Dynasty, students are required to master 6 skills, namely, Rites (it’s similar with the moral education of today), Music (being able to play several musical instruments), Archery, Driving (the skill of controlling a carriage), writing (being able to read and write) and calculating (know the operation laws of the universe, that is understanding The Book of Changes). After we got a rough understanding of the six arts, we headed to the Dacheng Hall to perform four-worship to Confucius and write a wish card there. As Confucius is a famous teacher, editor, politician and also philosopher, lots of people came there to pray for good academic performance for their families or themselves. Appropriate the Model of Chengdu in the past, practicing calligraphy, practicing archery, and Q&A about Dao are also part of the activity, but due to our limited time, we only practiced stone rubbing (the way ancient Chinese people printing books) before we leave. 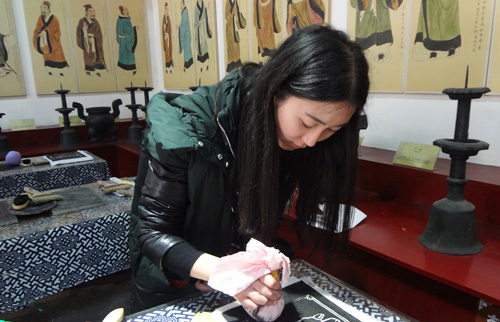 But I had to say that stone rubbing is really an unforgettable experience. Though printing technology is truly advanced nowadays, it’s hard to imagine how clever ancient Chinese people are that they could come up with such printing skills! There were lots of rubbings for us to choose, among them are patterns of twelve Chinese zodiac signs and some ancient Chinese characters. See my rubbing works below. 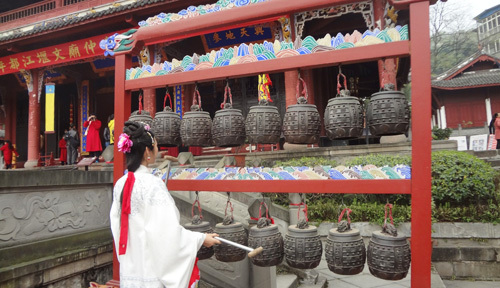 Want to know more about the experienced travel expert Bertina’s Chengdu trip? You could just CONTACT her directly or continue to read more about her travelogue. 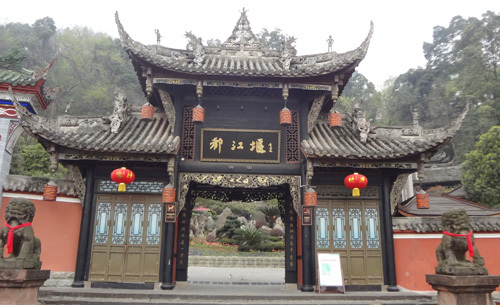 This entry was posted in travel experience, travel guide and tagged Chengdu Tour, Confucius Temle, Dujiangyan Tour by Travel Expert. Bookmark the permalink.